Henry Meredith : Canoe Surf Riding on Gold Coast, Africa, 1812. Early Modern Atlantic Africa and the African Diaspora (2009) on pages 103-104. The article as noted and forwarded by Herve Manificat in April 2013, with many thanks. Dawson, Kevin : Swimming, Surfing and Underwater Diving in Early Modern Atlantic Africa and the African Diaspora. Memorial University of Newfoundland Press, 2009, pp. 81-116. Dawson notes that Apollonia is on the Gold Coast of West Africa. 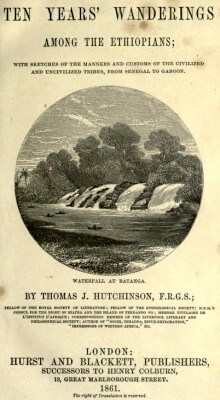 A standard account of canoe surf riding, where a suitable wave is selected and the crew and when riding the canoe is controlled by trailing paddles. As usual, the course is a direct line to the beach. There are a number of similar accounts from Africa, as well as from India and across the Pacific. In this case the dugout canoes probably did not have outriggers. in a rowboat could haul him out. Some accounts demonstrate that members of the African diaspora possessed exceptional swimming skills. (c) During a 1792 flood on St. Kitts, a biracial man dramatically saved a white woman from a different sort of marine disaster. Frederic W.N. Bayley, Four Year’s Residence in the West Indies, During the Years 1826,7,8, and 9, London, 1833, page 486.
danger...but those who are acquainted with the art of paddling canoes, perform their office with much dexterity. conduct a canoe on shore with surprizing velocity. firmly in a parallel position; when the canoe flies on shore with great rapidity. The canoe must be kept on a balance, and as straight a course as possible be observed; otherwise it will overset. Geoff Cater (2013) : Henry Meredith : Canoe Surf Riding on Gold Coast, Africa, 1812.